At its core, a contract is nothing more than a promise: If you do X for me, I’ll do Y for you. 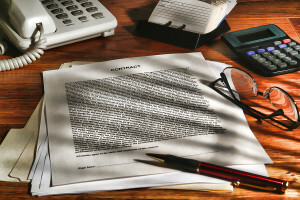 The only difference between a promise and a contract is that a contract is enforceable in a court of law. So what is this magic ingredient that turns a promise into a contract? If you think that a promise must be in writing to become an enforceable contract, you’d be wrong. We all enter into unwritten contracts every day, such as when you buy that cup of coffee in the morning, or that sandwich for lunch. In each case, you’re agreeing to pay the price of the item, and the seller is agreeing to give it you in exchange. Nothing is written down, but you’re nevertheless obligated to pay for the item. Offer. One of the parties must make a promise to do or refrain from doing some specified action in the future. Consideration. Consideration is the value that induces the parties to enter into the contract. One party must promise something of value in exchange for the promise of the other party. For example, if I promise to give you my mint copy of Amazing Fantasy #15 (the comic where Spiderman first appeared), without requiring you to do anything, I’m promising to give you a gift, and that promise is not enforceable as a contract. In contrast, if you promise to give me $1.1 million if I give you the comic, the promises rely on each other- we’re both giving up something in exchange for the other’s promise. Consideration doesn’t have to be money. It can consist of services, an agreement to do or not do something, or simply relying on the promise of the other party. Acceptance. The offer must be clearly accepted through words, deeds, or performance. Mutuality. The contracting parties must have had “a meeting of the minds” regarding the agreement, meaning they both understood and agreed to the basic substance and terms. As long as these four items are present, a promise becomes an enforceable contract, unless its unenforceable as a matter of law (for example, a contract to do something illegal is invalid and can not be enforced). So if a promise becomes a contract if it has these four elements, why do people say “get it in writing?” Because without a writing, enforcing that promise in court becomes a long, expensive nightmare.